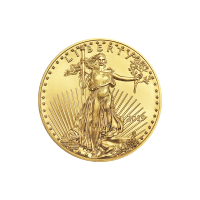 Pièce d'or American Eagle 2019 de 1/4 d'once You’ll pay the web’s lowest price, when you order your 1/4 oz 2019 American Eagle gold coin from our online shop today. The American Eagle enjoys status as one of the most sought after bullion coins on the planet, thanks both to the prestige of the US Mint and the infallible artistry of the AE designs. The obverse design is Augustus Saint-Gaudens’ breathtaking rendition of Lady Liberty shining proudly with the morning sun, olive branch and torch held fast. The obverse is bordered with 52 stars and bears the word, ‘Liberty,’ along with the coin’s year of issue. The reverse design, courtesy of Miley Busiek, features a bald eagle nest, the male bird brings home twigs with which to fortify the perch, as the chicks and mate keep watch. Also on the reverse, the American mottos and legend, along with the coin’s face value, content, weight and purity. The obverse design has been adapted from the 1907 original, which was used for the American Eagle’s debut coin, in 1986. Take home one of the world’s most iconic bullion coins and enliven your portfolio with a 1/4 oil 2019 American Eagle gold coin today.